d manufacture, sell, or transport intoxicating beverages from 1920 until 1933. Spirited: Prohibition in America, a new exhibition opening at the Lyman Allyn Art Museum explores this tumultuous time in American history, when flappers and suffragists, bootleggers and temperance lobbyists, and legends, such as Al Capone and Carry Nation, took sides in this battle against the bottle. Organized by the National Constitution Center, Philadelphia, PA, in partnership with Mid-America Arts Alliance, Kansas City, MO, Spirited: Prohibition in America explores the era of Prohibition, when America went “dry.” Visitors will learn about the complex issues that led America to adopt Prohibition through the 18th Amendment to the Constitution in 1919 until its repeal through the 21st Amendment in 1933. Through the exhibition, visitors will learn about the amendment process, the changing role of liquor in American culture, Prohibition’s impact on the roaring ‘20s, and the role of women, and how current liquor laws vary from state to state. In 1830, the average American consumed 90 bottles—or about four shots a day—of 80-proof liquor each year. Saloons gained notoriety as the most destructive force in American culture, where men would drink away their families’ money. Following extensive campaigning and lobbying by the Anti-Saloon League, along with groups representing women’s suffrage and the Woman’s Christian Temperance Union, on January 16, 1919, the 18th Amendment to the Constitution was ratified, and beginning January 17, 1920, Americans could no longer manufacture, sell, or transport intoxicating beverages. However, the Volstead act, the law enforcing the amendment, made exceptions for sacramental, medicinal, and industrial purposes as well as allowing families to “preserve fruit” through fermentation. In the years following, the country was split between “wets” and “drys,” speakeasies flourished, legal authorities gave chase to gangsters, and many created inventive ways to circumvent the law. Governmental agencies, including the Prohibition Bureau and the Justice Department, charged with enforcing the Volstead act were ill equipped to deal with the flood of illegal booze. 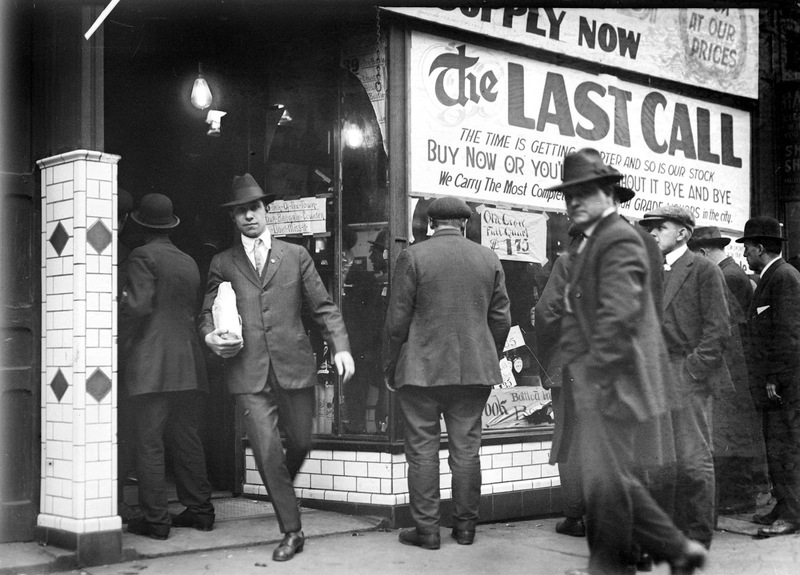 Along with rampant law breaking, Prohibition brought unexpected cultural and societal shifts from the development of mixed-gendered speakeasies to the growth of organized crime syndicated into national enterprises. The exhibition draws on the histories told from both sides of this divisive issue that riled passions and created volatile situations. In the end after a decade of wide-spread corruption, wavering public opinion, and the need to generate revenue from an alcohol tax, the 18th Amendment became the first ever repealed. With the passing of the 21st Amendment, Prohibition ended on December 5, 1933 to a very different America. Today, Prohibition’s legacy can be traced through state laws regulating alcohol, created to avoid the excesses before Prohibition and the corruption and lawlessness experienced during the roaring ‘20s. Spirited features semi-immersive environments that encompass the sights, sounds, and experiences of this fascinating period in American history..
A 1929 Buick Marquette. One of the bootleggers’ key innovations was the “Whiskey Six,” six-cylinder cars, such as the Buick Marquette on display, that bootleggers would modify extensively to accommodate illegal cargo and evade authorities. A hatchet used by the famous saloon buster, Carry Nation. A telephone used Roy Olmstead to operate his bootlegging empire. Olmstead, after leaving the Seattle police force, became the most successful bootlegger in the Pacific Northwest. He was also the plaintiff in Olmstead v. United States, one of the most important Fourth Amendment cases to arise during Prohibition. Original ratification copies of the 18th and 21st Amendments. Al Capone’s guilty verdict, which convicted the crime boss of not paying taxes on money earned from his illegal operations. A Prohibition Bureau Badge issued by the Department of Justice. Flapper dresses, cocktail couture, and other women’s and men’s fashion accessories from the 1920s. Original home manufacturing items used for making moonshine, homebrewed beer, and other illegal and highly potent liquor.